With the venerable Mark E Smith turning 60 years old this March, tQ and Baba Yaga's Hut will be throwing the Fall frontman a birthday party at the London Fields Brewhouse. 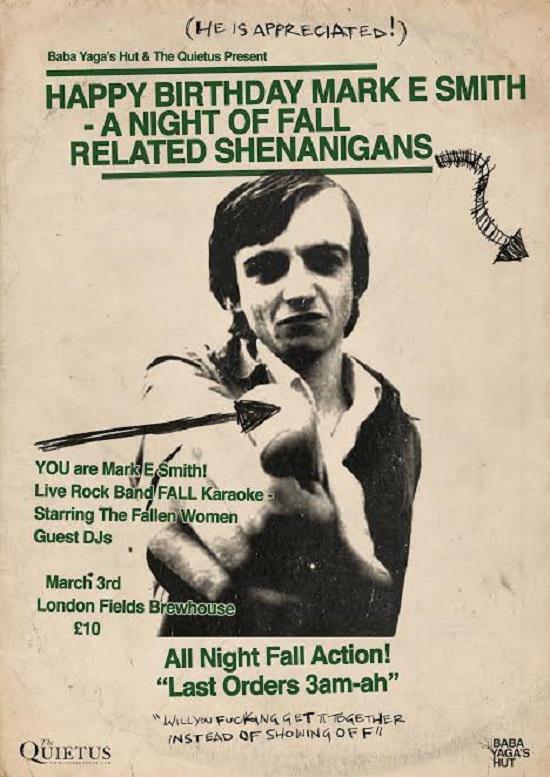 Taking place on March 3, a night of Mark E Smith-related shenanigans includes 'YOU Are Mark E Smith', guest DJs playing all manner of Fall-related goodness until 3 am, and live karaoke starring The Fallen Women. The Fallen Women consists of Charley Stone on guitar, Lolo Wood on keys, Melissa Reardon on drums and Heidi Heelz on bass (and kazoo on New Face In Hell). Tickets for the night are £10, and are on sale here. For full details you can check out the official Facebook event page here.